Fragrance never sounded so good! The WoodWick candle combines a natural wood wick with exceptional, long-lasting fragrance. What sets this wonderful candle apart is the wick — when lit, it sounds exactly like a crackling fireplace! 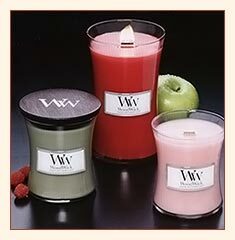 WoodWick candles are available in two sizes: the 11.5 oz. jar, which will fragrance your home for 100 hours, and the 22 oz.jar, which will fragrance up to 180 hours. And each jar is topped with a reusable custom wood cap with the WoodWick logo. Just listening to this candle is fun! Combining your own favorite scent with the fireside sounds created by the wick transports you a mini vacation spot right in your own home. Here at Pinelands, we have a fine assortment of sizes and fragrances available just for for you. Everyone seems to have a particular favorite fragrance — come in today and find the perfect scent for your home.